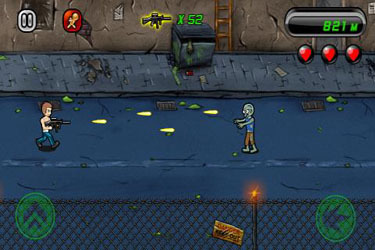 Shoot and blast through bodies to survive as long as you can in a zombie infected city! This is a basic and simple Android game which helps you kill time for a few minutes. If you’re ever in the mood for a mindless bit of playing and you have low expectations from a game, then Zombie City would be ideal. 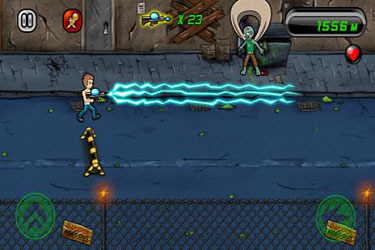 Gameplay: There’s two main buttons on the screen: shoot and jump. Your action hero keeps walking right at a constant speed and zombies will miraculously appear or float down from a parachute (… yeah it’s just a game so don’t think too hard please!). You need to help him survive as long as possible by jumping over the hurdles, and shooting the zombies before they get to you. You’ll see power-ups as you travel along and these give you different abilities which include three types of weapons, a protection shield and a flying boost. Good stuff: The game speed was decent on our test devices and it felt pretty fast to respond to our button presses. So the game gives you a chance to interact with it properly and enjoy playing it. The cartoony visualisation wasn’t bad and the whole overall theming was done well to immerse you into an eerie zombie setting. As per the beginning of the review – as long as you don’t expect anything from this game, then you can play it for a couple of minutes. If you like setting yourself challenges of trying to get as high a distance as possible then you’ll enjoy this slightly longer. Verdict: 1/5 [Ed: Rating adjusted from 2 stars after Devil Ninja was reviewed] A good game for some short and instant action. Unfortunately, it’s a bit too close to mindless gameplay and since the skill level is low then you’ll most likely tire of the game quite early on… in fact I’m so tempted to give it 1 star in certain aspects. However it’s not bad for playing between friends and trying to compete to see who gets furthest… that’s what we did. If you’re not with your mates, then I’d probably suggest playing Fly Boy instead because it’s more interesting. Keep an eye out for the road blocks/hurdles. When you see these and you see a zombie floating down then it’s very easy to lose lives. So try and time an empty jump which will let you shoot the falling zombie prior to your actual jump over the obstacle. The super flying sections give a lot of extra distance for free, but try not to get them unless you have over one heart because you can sometimes fall straight into an unavoidable obstacle or zombie.